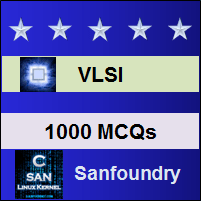 This set of VLSI Multiple Choice Questions & Answers (MCQs) focuses on “Built-in Self Test”. Explanation: Built-in self test objectives are to reduce test pattern generation cost, to reduce volume of test data and to reduce test time. Explanation: In data compression technique, comparison is made on compacted test response instead on entire test data. Explanation: Signature analysis performs polynomial division that is division of data out of the device under test. Explanation: The signature analysis method is represented mathematically as R(x) = P(x) / C(x) where R(x) is the signature, C(x) is characteristic polynomial. 5. Transition counting does the count of transition only in one specific direction at a time. Explanation: Transition counting does the count of transition in specified direction ( 0 t0 1 or 1 to 0). 6. BILBO uses only signature analysis. Explanation: Built-in logic block observer method uses signature analysis in conjunction with a scan path. 7. In which mode, storage elements are used independently? Explanation: In normal mode, storage elements are used independently and in this mode signal B1=B2=1. Explanation: When B1=B2=0, storage elements are configured as scan path, they are connected as serial shift register. Explanation: When B1=1 and B2=0, the circuit is configured as LFSR mode and can be used as either polynomial divider or random test pattern generator. Explanation: When B1=0 and B2=1, in the final mode, the BILBO is reset. Explanation: Self-checking technique consists of supplying coded input data to the logic block under test and comparing the output. Explanation: The type of error in self-checking techniques are simple errors, unidirectional errors and multiple errors. Explanation: The parity check detects simple errors using XOR gates and for each type of error, approximate coding technique is used. 14. Which errors are detected using duplication codes? Explanation: Multiple errors are detected using duplication codes which consists of duplicating the information.